You'll find every Chicago loft, condo and high-rise currently available for sale on this site with pictures, pricing and more. Search all Chicago condo buildings and see what's available in each. Filter by neighborhood, building type and more. The Highrises Team is a group of Chicago high-rise specialists. Contact them for expert representation. You'll know exactly how much you can afford. We don't want you to fall in love with a condo or loft only to find out that it's out of reach! Sellers want to know that you're serious. When we submit an offer on a property we'll want to include your Pre-qualification letter from a lender. If there are multiple offers on the property the ones without this letter probably won't be considered. Are you looking for an "airline view" from your living room or bedroom? Highrises.com can connect you with one of our condo specialists who can help you find a building with a beautiful view. Our condos for sale in Chicago, IL have great amenities, so contact us today if you would like to see some of our featured Chicago luxury condos and discover how luxurious your living situation could be. Chicago has so many high-rise condo towers that we have put together a list for your convenience. These buildings are just the top 10 but you can see them all on our Tallest Chicago Condos page. If you are searching for a condo, Chicago certainly has plenty of options. 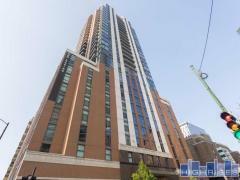 There are many new condos in Chicago, IL located in great areas. Perhaps you're interested in Chicago's most famous downtown location, the Magnificent Mile. This stretch is packed with high-end shopping and mega-malls, but also contains plenty of art, culture, and history, including the Historic Water Tower. If you prefer a more residential area full of historic European architecture, you may want to consider a two-bedroom condo for sale in Irving Park on the north end of the city. Some of the most beautiful condos for sale are located in the Hyde Park area. Hyde Park is rich with history and culture, including the Robie House, an architectural icon designed by Frank Lloyd Wright. Hyde Park was also the site of the illustrious 1893 Chicago World's Fair. Want to have a view of Lake Michigan? Explore your options in the popular Gold Coast neighborhood. When it comes to low-maintenance condo living, Chicago won't let you down with its cultured lifestyle filled with entertainment options. The Lancaster - This building is perfectly situated in one of the best locations in Chicago - Lakeshore East. This building is perfect for dog owners of any size which is rarity in Chicago. Couple that with a 6 acre park right across the street. The Heritage - Located in the Chicago Loop across from Millennium Park, this Dog Friendly luxury condo building allows you to have 2 little buddies. With a dog run equipped with astro-turf and a couple of fire hydrant's you will not even have to leave the building. The Grant - With a high pet weight limit this high-rise located in the South Loop is the perfect home for dog owners. The Legacy - Located near Grant Park, this dog friendly building allows you to have up to 2 dogs and has a dog run in the building. These are just a few examples of our luxury condos. Chicago for sale condo listings can be explored in depth with one of our agents. Contact us and let us know what you're looking for and we'll help you find the perfect building for your whole family. Listing information last updated on April 19th, 2019 at 3:51pm PDT.